There are few better places to spend a summer day than casting for trout in a high, alpine lake. 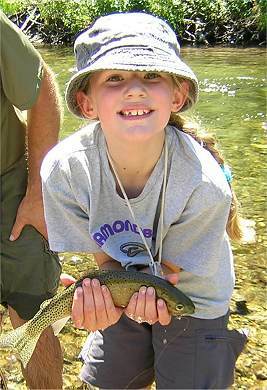 Swan Range alpine lakes are stocked regularly with 2-inch Westslope cutthroat trout. Below is a list of lakes and the year they were stocked. For best results, try 3-4 years after the latest stocking date. Westslope cutthroat trout eat insects, so a fly rod can be the best tackle. However, the fish will also strike at small spinners. Get a complete mountain lakes stocking list and fishing regulations from Montana Department of Fish, Wildlife and Parks. Clean flowing water and gem-like alpine lakes make the Swan Range and the South Fork of the Flathead Valley an angler’s Valhalla. Some 75 mountain lakes dot the high country, many of them stocked with westslope cutthroat trout — providing family-friendly fishing and great eating. Handkerchief Lake is known for grayling, and has produced more than one state record. The South Fork of the Flathead River is one of the last places in the West where anglers may legally pursue bull trout, a threatened species that needs cold, clear water. The Swan Range is also popular for hunting, in season. There is a general season for elk and deer and black bear, with hunting for mountain goats and moose allowed by special permit. Forest grouse are the most popular small game in this area.